1In a large skillet, cook the bacon until crisp; transfer to a bowl with a slotted spoon. Meanwhile, bring a pot of water to a boil and cook the gnocchi until they float to the surface (or according to the package directions). Remove with a slotted spoon into the hot skillet with the bacon drippings and stir around for a few minutes, until they start to turn golden. Remove and set aside in a bowl. 2Add the peas to the skillet and cook for a few minutes, until heated through. Add the cream and bring to a simmer, then tear (or shake) in the spinach and cook until it wilts. Continue to cook until the mixture thickens to the consistency of heavy cream. 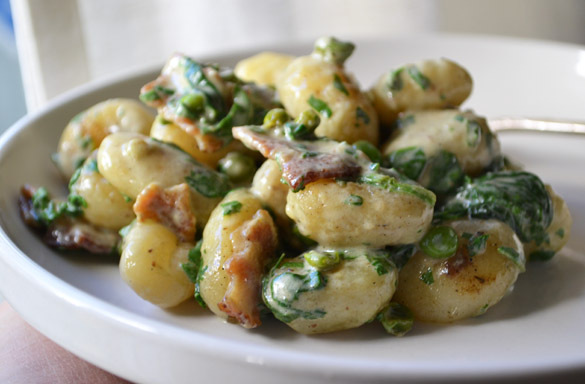 Stir the gnocchi back in and serve immediately, with Parmesan for grating on top.